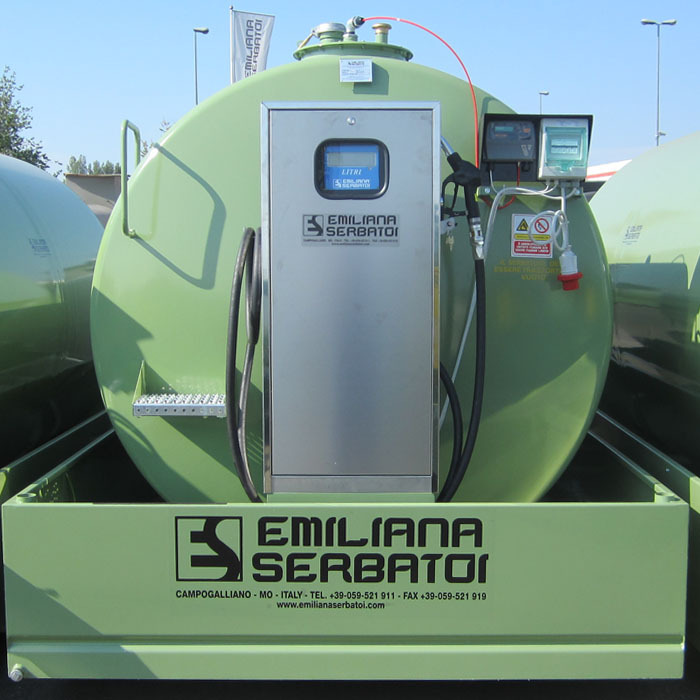 Steel tanks for Diesel fuel storage and delivery, homologated by Italian Ministry of Interior in accordance with Italian M.D. 19/3/1990 ( M.D. 31/7/34 Title I N. XVII, M.D. 19/3/90, M.D. 12/09/2003 and DCPST/A7/4984/AT/09189 dated 26/07/2007) and subsequent renewals and extensions. 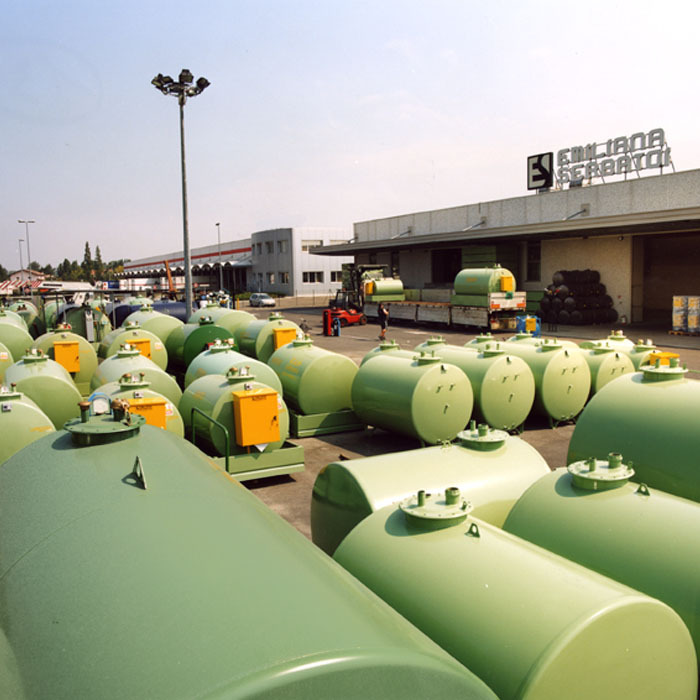 Available Nominal Capacities: 490, 1000, 1300, 2400, 3000, 5000, 7000, 9000 lt.
Horizontal cylindrical tanks manufactured by using shell plates and dished ends made of carbon steel quality S235JR according to UNI EN 10025, watertight electro-welded (submerged arc welding process), provided with anti-roll supports, primed with a rust preventing layer and finished with a layer of green paint. 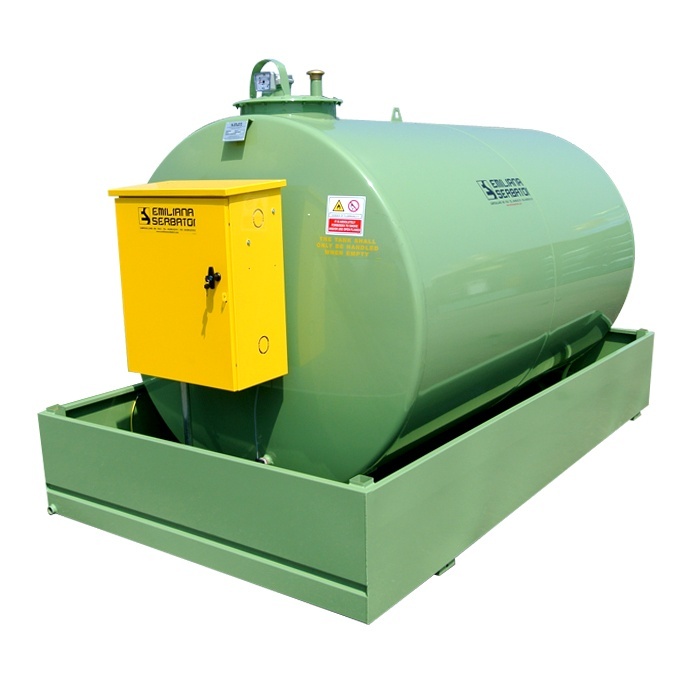 Tanks are delivered pressure-tested and ready-to-use. Mechanical float operated tank contents gauge with planetary gear, adjustable scale in cm. Suction point equipped with check valve, strainer and ball valve. Made of carbon steel sheets, self-supporting base frame designed to be bolted to the tank’s bottom supports; it can be placed on any type of surface (even for permanent installation) and is designed according to the capacity of the tank and in compliance with the safety limitations set in the Ministerial Decree 19-03-90. It is provided complete with lifting plates, grounding connection point, drain plug for routine maintenance and cleaning and n° 4 housings suitable for fixing the uprights of the roof system. It is completely primed with a rust preventing layer and finished with a layer of green paint. Roof system for protection against weather conditions, composed of a sturdy zinc-coated steel frame on which is fixed a self-bearing zinc-coated trapezoidal metal sheeting; it is designed to be easily and rapidly mounted and bolted to the Tank Fuel. Switchboard contained in a dedicated IP 55 protection box including on/off switch, emergency button and the minimum level pump shut-off switch. Self-priming rotary vane electro-pump, flow rate 50-70-90 l /min., built in by-pass valve, line strainer, assembled to a 230 Volt AC single-phase motor or 400 Volt AC three-phase motor (also available in a TFM manual version). Pumps consist of a cast-iron casing, sintered steel rotor and acetalic resin blades, mechanical seals. Grade of protection: IP55. 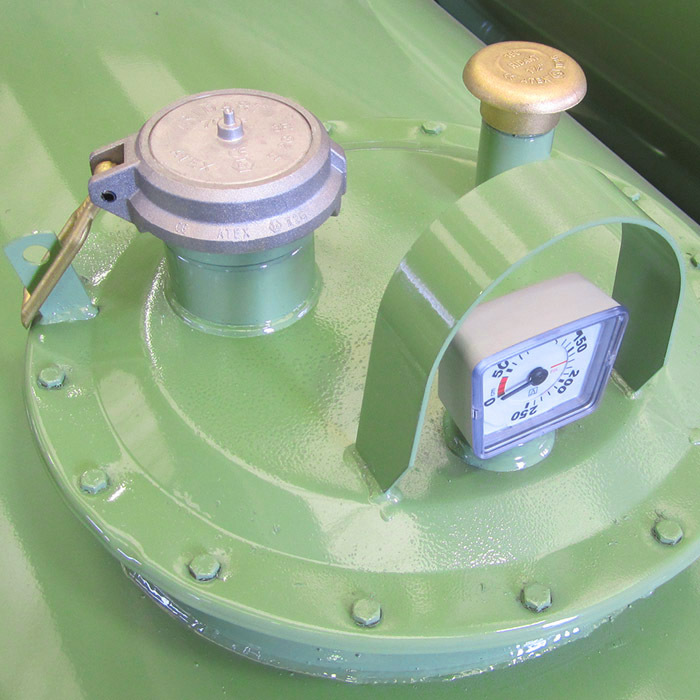 Nutating-disk mechanical fuel meter, designed for non-commercial use only, mechanical readout device with rotating wheels, subtotals can be set to zero and progressive total counter. Accuracy +/- 1% of the flow range after calibration. Repeatability 0,2%, max operating pressure 10 bar. 4 m of antistatic rubber hose for oil and Diesel fuel. 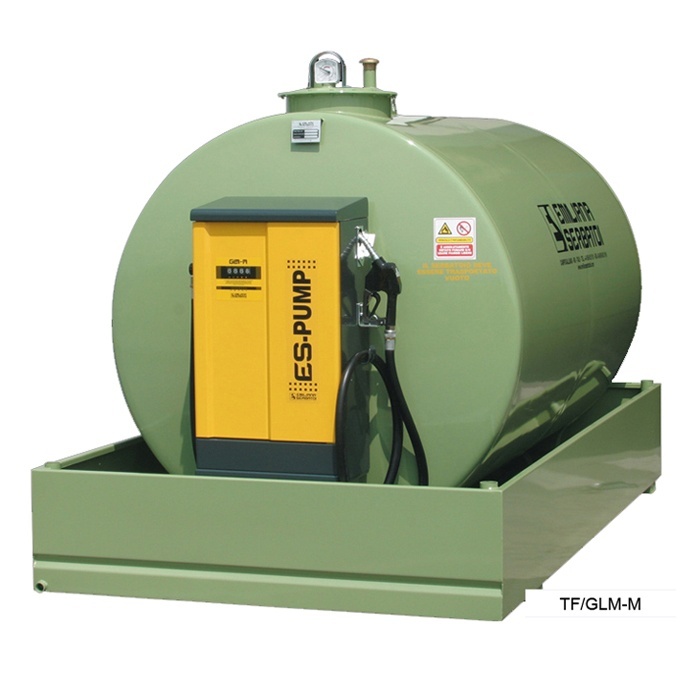 TF/50: Dispensing metal cabinet, equipped with a 230/400 Volt motor pump, flow rate 50 l/min. TF/70: Dispensing metal cabinet, equipped with a 230/400 Volt motor pump, flow rate 70 l/min. TF/90: Dispensing metal cabinet, equipped with a 230/400 Volt motor pump, flow rate 90 l/min. 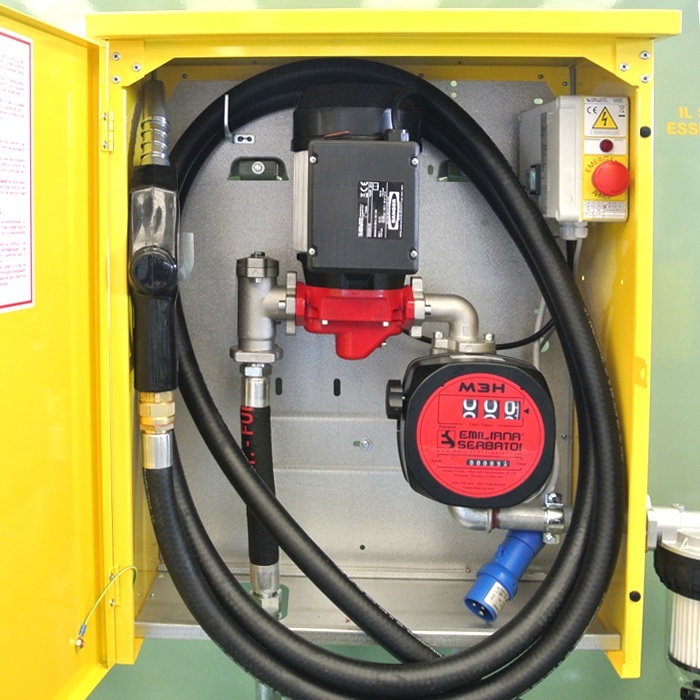 TF/M: - Dispensing metal cabinet, equipped with a manual rotary pump, 4 m of antistatic rubber hose for oil and Diesel fuel, size 3/4”, completed with manual fuel nozzle, strainer and check valve. 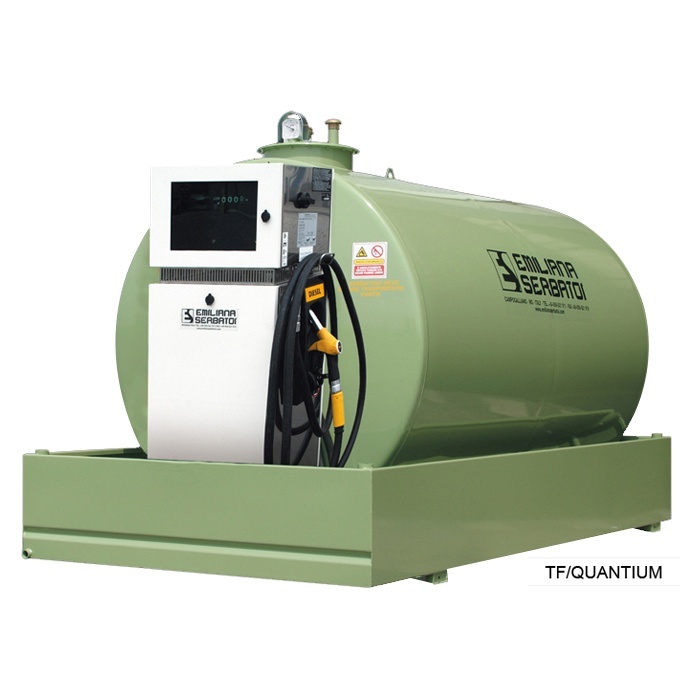 TF/QUANTIUM: Industrial type fuel dispenser, compact design, island-oriented with hose hook, piston meter with integrated pulser, electronic calculator with LCD displays rotary vane suction pump, flow rate from 40 to 130 l/min, antistatic rubber hose, automatic nozzle, corrosion resistant chassis and panels. EC certified and Metrical compliant. Flow rate from 50 to 130 l/min. 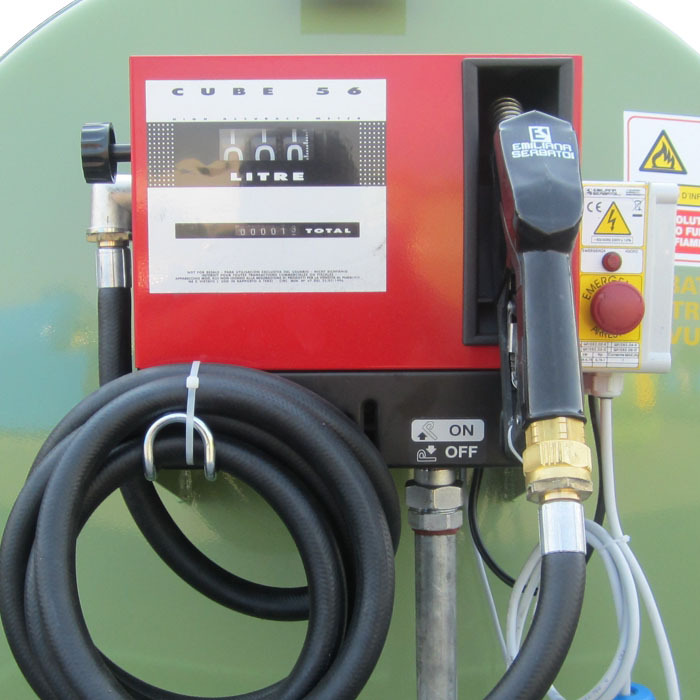 TF/Eco: Industrial type fuel dispenser, electronic or mechanical head, rotary vane suction pump, flow rate 70 l/min, antistatic rubber hose, automatic nozzle, corrosion resistant chassis and panels. Single-phase or three-phases motor ATEX certified in compliance with European Directive Atex 94/9/CE. EC certified and approved for Class C fuels. 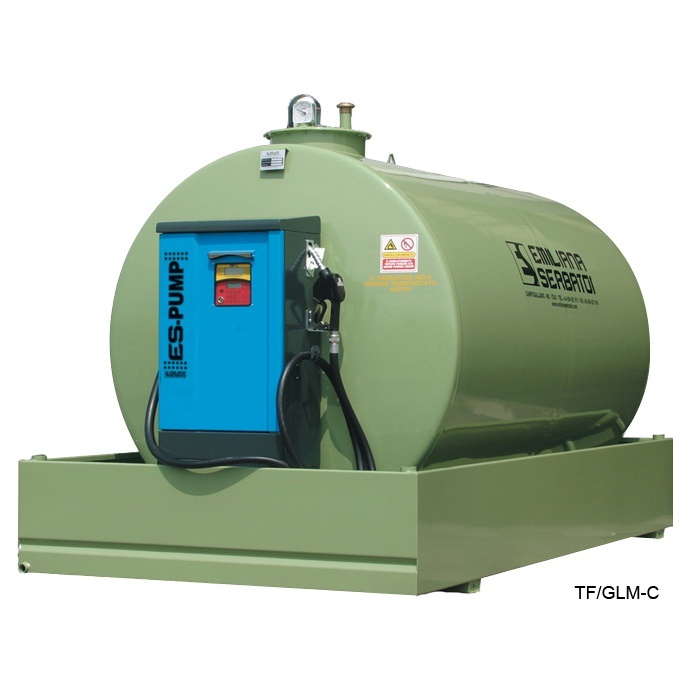 TF/Fimac: Industrial type fuel dispenser, electronic or mechanical head, rotary vane suction pump, flow rate from 50 to 120 l/min, antistatic rubber hose, automatic nozzle, corrosion resistant chassis and panels. Single-phase or three-phases motor ATEX certified in compliance with European Directive Atex 94/9/CE . 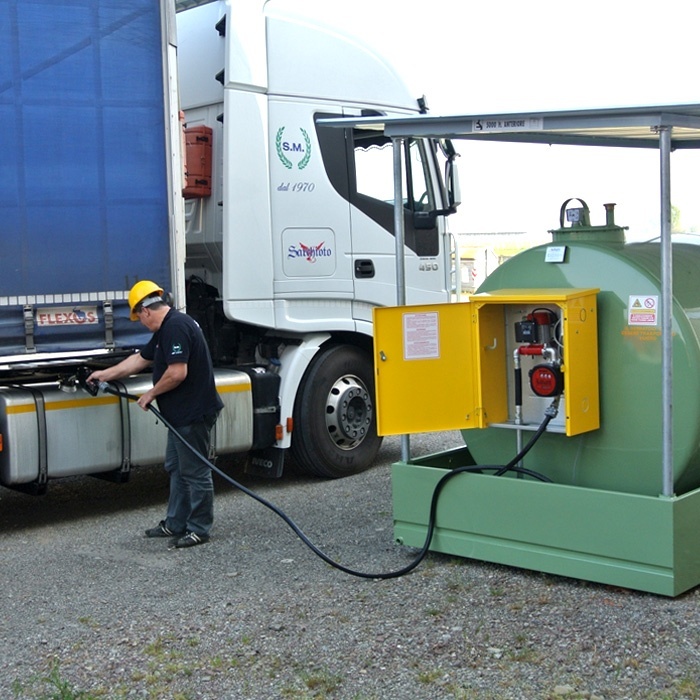 EC certified, Metrical compliant and approved for Class C fuels. TF/GLM-M: Mechanical type sturdy and reliable dispenser for non-commercial use; exclusive attractive shape, high efficiency and low-maintenance design. Flow rate 70 - 90 l/min. TF/Cubo 50-70: Cube 50-70 dispensing units, consisting of an oven-baked powder coated metal self-bearing frame equipped with a self-priming vane motor pump assembled to a 230 Volt – 50 Hz motor, flow rate 56-70 l /min., including by-pass valve, line strainer, mechanical non-commercial fuel meter, 4 m of antistatic rubber hose for oil and Diesel fuel and automatic fuel nozzle. TF/GLM-C : Sturdy and reliable dispenser for non-commercial use; exclusive attractive shape, high efficiency and low-maintenance design. 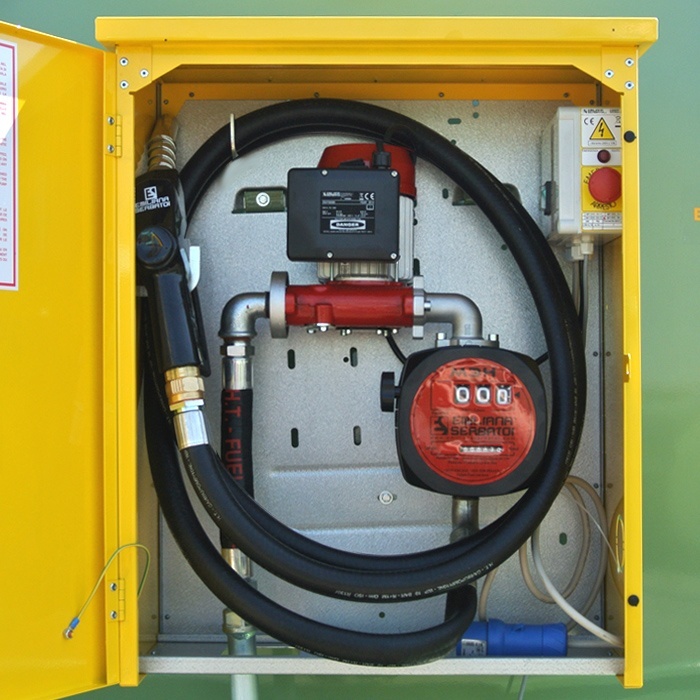 Equipped with electronic head and calculator, MC box system, a multi-user system (up to 80 users/keys) which enables the control of the fuelling operations and the monitoring of the fuel consumption. It can be operated only by authorized personnel provided with user codes and magnetic keys. The total consumption per each user is recorded directly on the electronic system which is able to store data of the latest 200 operations. Dedicated software for printing reports of the refueling operations and individual user summaries is available. TF/GLM-E : Sturdy and reliable dispenser for non-commercial use; exclusive attractive shape, high efficiency and low-maintenance design. 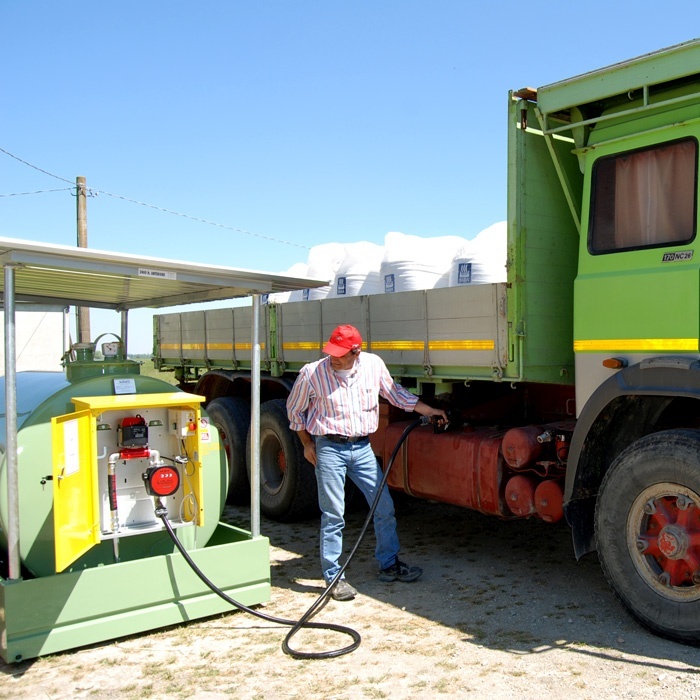 Equipped with electronic head and calculator, FM electronic system, a multi-user system (up to 120 users/keys) which enables the control of the fuelling operations and the monitoring of the fuel consumption. It can be operated only by authorized personnel provided with user codes and magnetic keys. The total consumption per each user is recorded directly on the electronic system which is able to store data of the latest 200 operations. Dedicated software for printing reports of the refueling operations and individual user summaries is available. 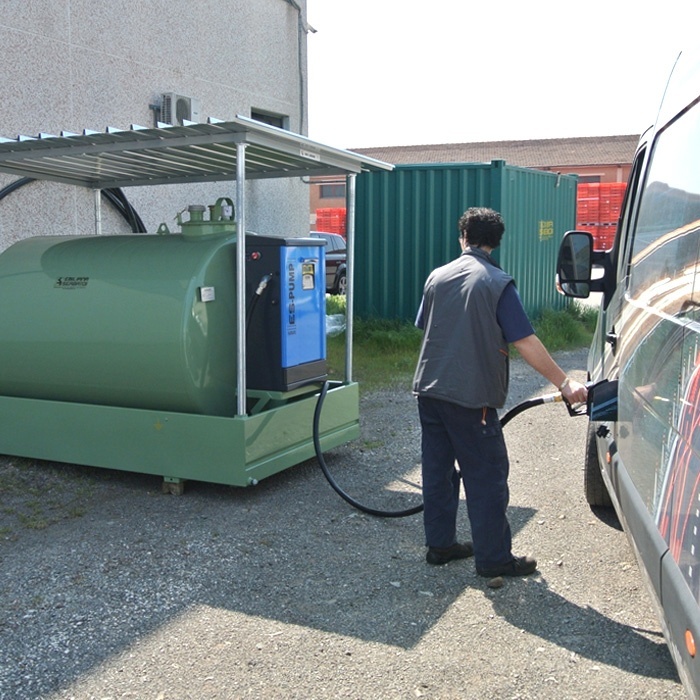 CVTV : Integrated unit which consists of a fuel dispenser with an incorporated refueling management system . It is based on TF/Eco dispenser on which is installed the Amico 2002 TAG on-line system or the Emiltouch system. 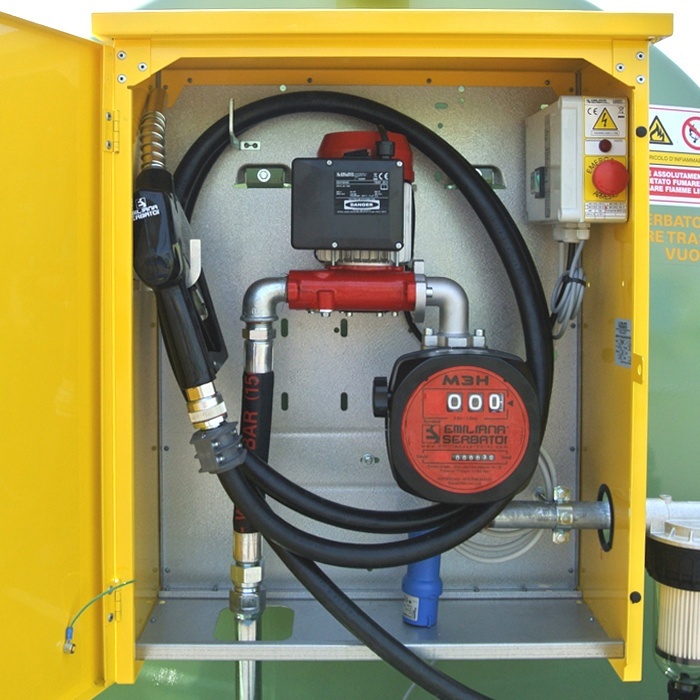 TF/SS-FM : Diesel fuel dispensers with multi-user panel. Flow rates from 70 l/min (SS 70 FM) to 90 l/min (SS 100 FM). Fuel management systems are designed to effectively measure, control and manage the use of fuel within companies’ fleets. They are typically used for fleets of vehicles, construction machines and equipment as well as any vehicle that requires fuel to operate. They represents a complete and economical systems to continuously monitor and track fuel inventories, fuel purchases and fuel dispensed. These information can be stored and processed with dedicated software systems which enable consumption control, cost analysis and tax accounting for fuel purchases. EMILTOUCH: Fully integrated High-Tech Fuel Management System based on Windows operating system; it consists of a touch-screen module, 8” display, TAG reader, GPRS module, I/O board and power supply module. The system is designed for connection via LAN, GPRS, as well as for downloading data via TAG. AMICO 2002: AMICO 2002 is Fuel management system available in two models, Amico 2002 CARD and Amico 2002 TAG; each one of them is also divided in the following versions: Basic – Cable Connection – Online. Amico 2002 CARD is provided with smart cards containing a microchip with an integrated circuit capable of processing and storing thousands of electronic data. The data transmission is obtained by a contact reader. AMICO 2002 TAG is designed to work with access key which are programmable RFID proximity key tags communicating with the system by simply approaching them to the Radio Frequency IDentification Reader. Due to its specific characteristics it ensures optimal reliability also in a very dirty and dusty environment. MC BOX, Electronic control panel: The MC system consists in a multi-user panel, a dedicated software and a series of accessories to export the data to a PC. A complete system to enable the control of the fuel consumption. Optional as incorporated in the GLM-C dispenser. 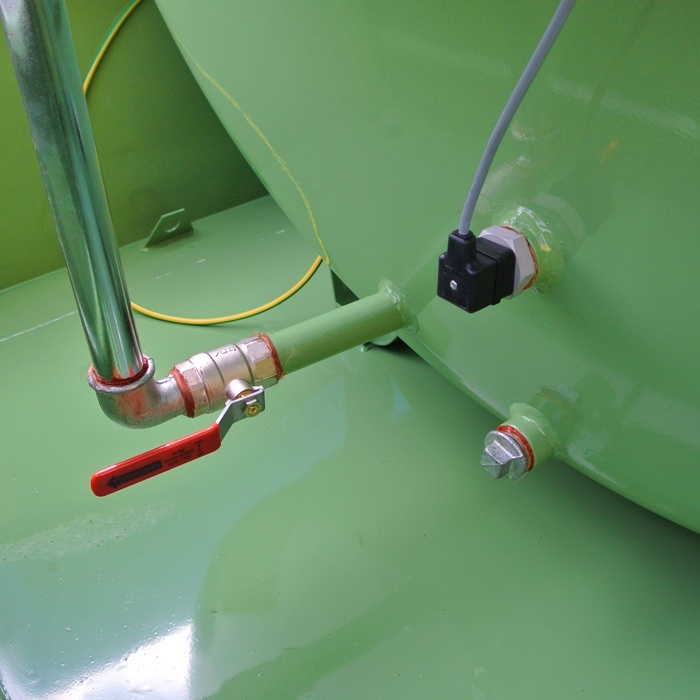 OCIO: System for monitoring continuously the fuel level inside tanks (including underground tanks). 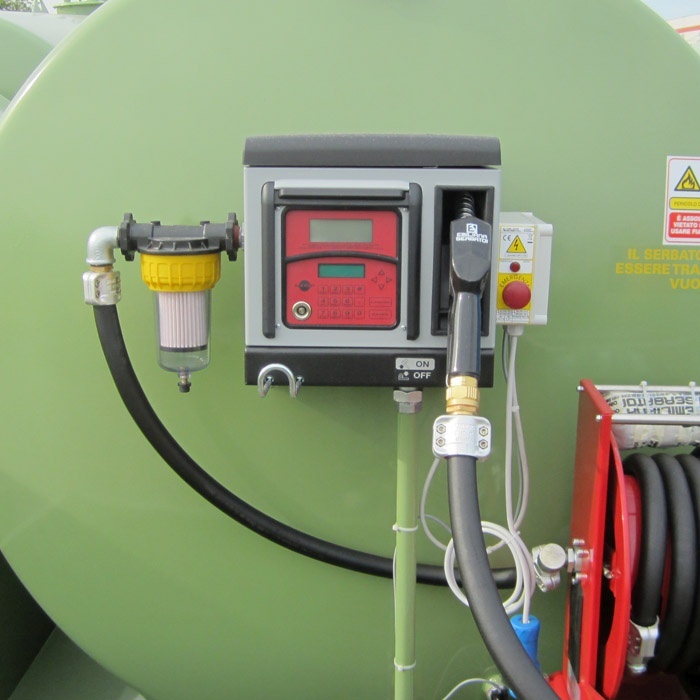 The system is designed to detect the static pressure generated by the fluid height by means of an hose dipped in the tank down to the bottom; a control unit provided with a dedicated software is able to display the fuel level or the fuel volume. 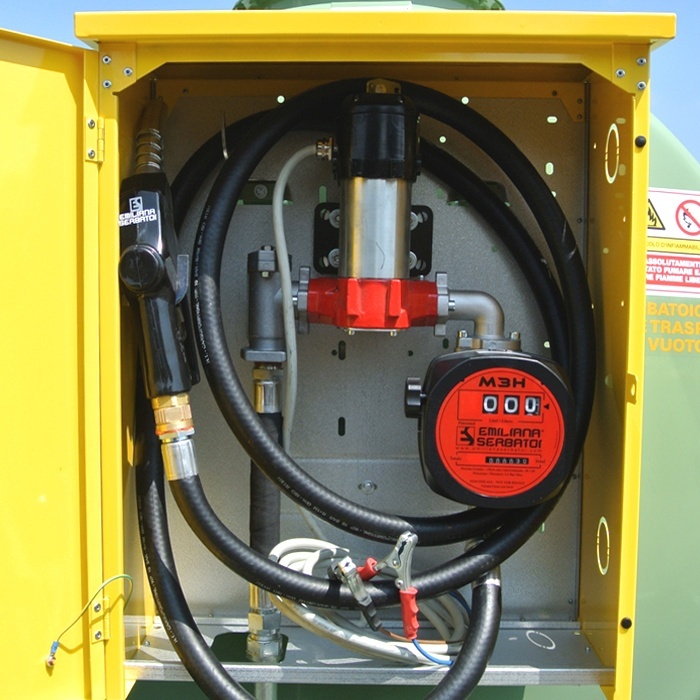 The control unit allows to set the shape and the dimensions of the tank, the level alarms, the level indications, the units of measurement and to calibrate the equipment. ES-LEVEL: High-precision magnetostrictive modular level gauge which allows monitoring continuously the fuel level in the tanks. It is designed to act as level gauge, level switch and level transmitter; in addition it can be provided with other functions as water detector and water level display, acoustic and bright alarms and temperature sensors. Available also in ATEX version. SECURE BOX: Made with galvanized steel sheet and Approved by Ministry of Interior, SecureBOX is designed to give full shelter to Tank Fuel by replacing the function of the roofing. Its size corresponds to the dimensions of the containment basin and it is provided with Tubular for fixing within the basin. TANK BOX: Metal box which consists of a steel frame made with squared profiles and panelized with trapezoidal self-bearing zinc-coated sheeting. It is provided with key lock, double hinged door and ventilation grids. Pitched roof to ensure better waterproof and windproof seal. Very easy and quick assembly. HOSE REELS: Manual or spring rewind hose reels. Series AISI 304 stainless steel or painted carbon steel in the manufacture of frames, discs, drums and components; they are designed to minimize the maintenance and part replacing due to corrosion. 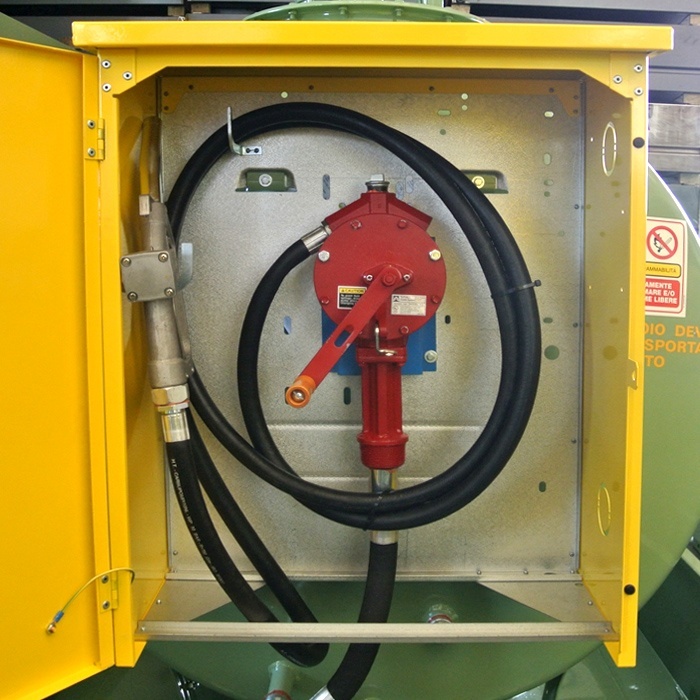 Our range of hose reels reflects various installation and performance requirements. They can be equipped with several accessories as stoppers, swivel joints, roller guides and gaskets. FILTERS: Wide range of filtration units for superior in-line filtration protection. They are designed to remove water and dirt from fuels. Depending on the type of cartridge selected these systems can be used as filters (to remove solids), absorptive filters (to reduce free and emulsified water by absorption) and filter separator (to remove water from fuel by physical separation). 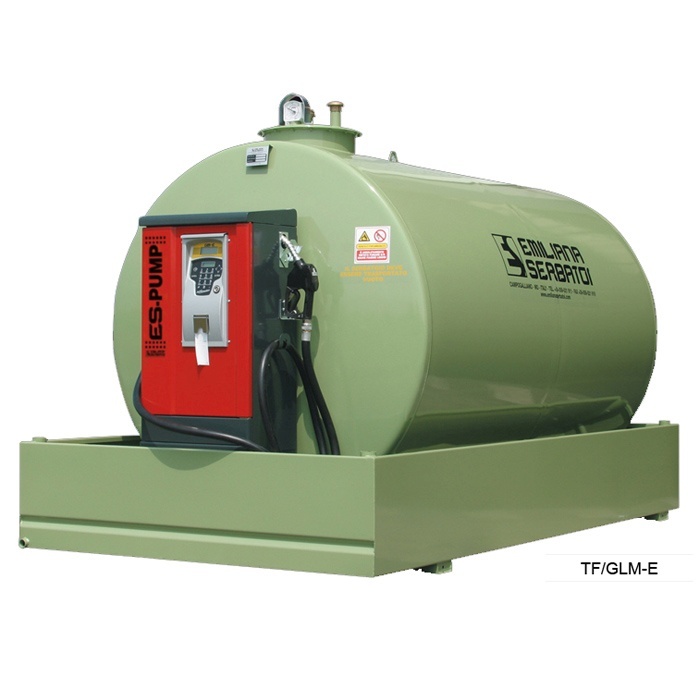 OIL FUEL CONTAINER: Metal Box Container, designed for storage and handling of Diesel fuel and lubricants. 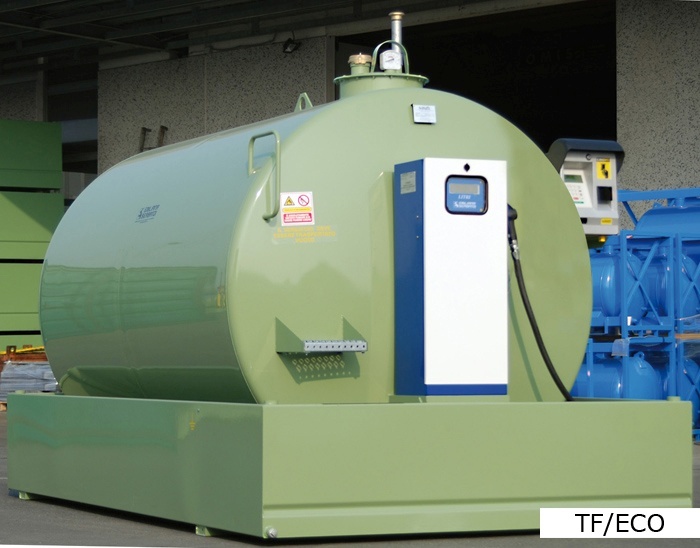 They are provided with Ministerial Approval issued by Italian Ministry of Interior for Class C flammable liquids and for a maximum of storage capacity of 9000 litres. Declaration of Conformity, accompanied by a copy of the Ministerial approval and a copy of the Ministerial decree 03/19/90.